This story is especially relevant because we live in an age when many developing and developed nations run astronomical and unsustainable fiscal deficits yet are led by men and women who pretend this does not matter. (i) Currently global public debt stands at over fifty-seven TRILLION dollars and is growing rapidly as most governments around the world use debt to finance their short-term economic growth (I urge the reader to visit this Economist link to see for themselves). 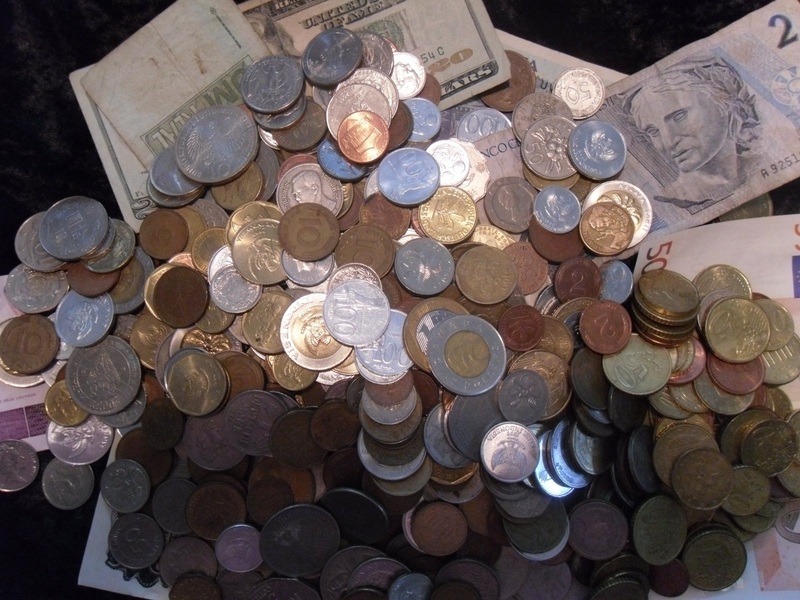 (ii) All rational people know that neither countries nor individuals can continually borrow large sums of money that they will have extreme difficulty paying back; especially when a significant percentage of that money is not used for development and education. At some point the debt bubble will burst when the financial burden becomes overwhelming for the individual or country. We saw this phenomenon during the debt crisis in Argentina in 2001-2, when the government simply could not make payments on its tremendous financial obligations and defaulted, and more recently during the still ongoing Eurozone crisis that forced multiple countries to make severe budget cuts which has heightened social angst and political instability, most notably in Greece. Thus, this article will seek to examine how modern countries finance their astronomical deficits, who bears the brunt of the cost, and the long-term impact of these astronomical deficits. This article will look at how developed and developing countries have reacted to this crisis by focusing on the United States and Indonesia, but it will also seek to illustrate that this is a global phenomenon. Modern policymakers finance national deficits through a variety of ways, most notably government bonds. When you buy a government bond you are loaning that country’s leadership money, which the government pays interest on and eventually repays in full. The amount of interest the holder of the bond earns is typically calculated based on the likelihood of said country paying you back. Thus, the interest rate on German government bonds is significantly lower than that of Greek government bonds because almost all neutral observers would conclude that Germany is much more likely to fulfill its financial obligations than Greece. (iii) However, in both cases the aforementioned countries are financing their spending by borrowing money. There is nothing intrinsically wrong with governments borrowing money, but I think most citizens assume that their leaders have reasonable plans for paying off national debts, which, unfortunately, is often not the case. This article will try to avoid placing blame on specific political actors for the explosion in federal debt, other than to point out the obvious, which is that this is a relatively recent phenomenon that can be traced back to early eighties, but has really accelerated since 2000. Furthermore, over fifty-five percent of government spending is on social welfare programs such as social security, Medicare, Medicaid, and welfare. (v) These programs have gradually taken a larger percentage of the U.S. budget over the past few decades as spending on education and related programs constitute a much smaller percentage now than ever before. (vi) There are several reasons for this, most notably people live longer lives today and, thus, collect more benefits, and the large amount of political power that senior citizens have, which makes cutting these programs very unpopular. Certain programs such as Social Security, Medicare, among others will run out of money in the next few decades. (vii) This does not necessarily mean the end of these programs, but it means the federal government will have to drastically cut benefits or find a way to raise new revenue, e.g. new taxes, which seems unlikely given the anti-tax climate that permeates American politics today. When President Jokowi was elected, gasoline subsidies constituted twenty percent of Indonesia’s annual budget. (xi) Removing them was a politically unpopular, but very brave move for President Jokowi, which cost him significant political capital. However, since then Indonesia has been plagued with deficit problems as government projections of expected revenue have consistently fallen short. (xii) Unfortunately, this is not a unique problem to Indonesia as politicians worldwide often set unrealistic revenue goals, which nonpartisan policy watchdogs can only scoff at. Large amounts of national debt have become increasingly problematic in the emerging world, not only in Indonesia, and are especially worrisome because most developing countries’ economies rely on commodities such as oil, valuable minerals, etc., which are constantly in danger of price shocks. (xiii) For example, if the demand for palm oil was to suddenly drop, Indonesia would have a much more difficult time fulfilling its budget obligations because palm oil is one of its major exports and revenue producers. It is difficult, if not impossible, to truly quantify the costs of a country facing a major debt crisis. Crises such as this bring political division and strife, in addition to the financial burden on citizens. As mentioned above, Argentina faulted on its debts mot too long ago, in 2001-2, during which “savers’ accounts were frozen to stop a run on the banks and violent street protests led to dozens of deaths.” (xiv) Nor has Argentina recovered as it defaulted again 2014 and continues to deal with a sluggish economy. In other words, this problem is here to stay. Many of history’s most malevolent leaders seized power or were ushered in because of economic crises. Thus, the social spending financed by public debt that allows the grandparents and parents of a certain generation to live above their means will be passed onto their children and grandchildren, but even worse than the actual financial burden may be the political results. For developing countries such as Indonesia, having an extremely large debt burden makes continued economic development difficult, if not impossible. For developed countries such as the United States they impede the ability to compete in the global economy. The debt that countries are using to finance their expenditures is simply not sustainable. All bubbles burst and the sovereign debt bubble will burst too. When combined with the vast amount of private sector debt for companies and individuals around the globe, which deserves its own article(s), it has the potential to literally destroy the world we live in. The biggest problem is that most of this debt is not used for development, so there is no long-term payoff. This may be an unsexy topic to write about, but it is critical that as global citizens we do something about it as soon as possible. (i) Please note that one Indonesiaful article cannot do justice to this topic, but I will do my best in the limited space I have. (ii) “The Global Debt Clock,” The Economist 22 November 2015, http://www.economist.com/content/global_debt_clock, accessed 22 November 2015. (iii) Sorry Greece, but it is true. 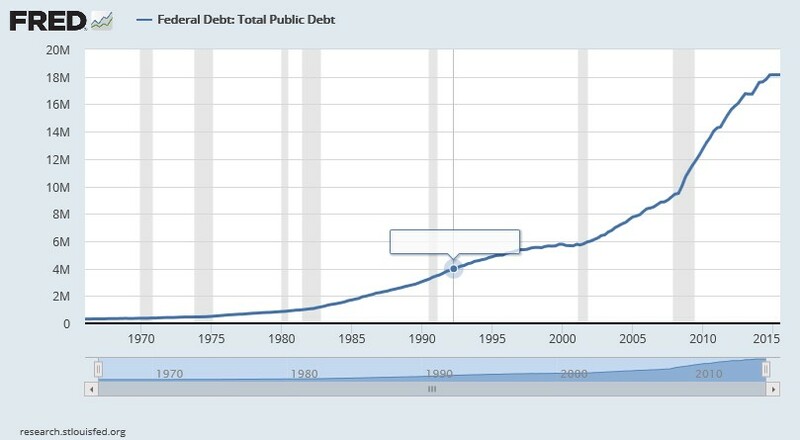 (iv) “Federal Debt: Total Public Debt,” Federal Reserve Bank of St. Louis 14 December 2015, https://research.stlouisfed.org/fred2/series/GFDEBTN/, accessed 14 December 2015. (v) Lam Thuy Vo, “50 Years of Government Spending, in 1 Graph,” NPR 6 November 2012, http://www.npr.org/sections/money/2012/05/14/152671813/50-years-of-government-spending-in-1-graph, accessed 21 November 2015. (vii) Brian Faler, “Social Security Funds to Run Out in 2035, Trustees Say,” Bloomberg 24 April 2012, http://www.bloomberg.com/news/articles/2012-04-23/social-security-fund-to-run-out-in-2035-trustees-say, accessed 21 November 2015. (viii) Tassia Sipahutar, “This Year’s Budget Deficit to Widen on Tax Shortfall,” Jakarta Post 10 November 2015, http://www.thejakartapost.com/news/2015/11/07/this-year-s-budget-deficit-widen-tax-shortfall.html, accessed 10 November 2015. (ix) “A Citizens’ Guide to Energy Subsidies in Indonesia,” International Institute for Sustainable Development 2011, http://www.iisd.org/pdf/2011/indonesia_czguide_eng.pdf, accessed 7 January 2015. (xi) Ndiame Diop, “Why is Reducing Energy Subsidies a Prudent, Fair, and Transformative Policy for Indonesia,” Economic Premise 136 (2014), 1. (xii) “Indonesia Plans to Issue Global Bonds in December to Help Fund 2016 Budget,” Jakarta Globe 19 November 2015, http://jakartaglobe.beritasatu.com/business/indonesia-plans-issue-global-bonds-dec-help-fund-2016-budget-official/, accessed 22 November 2015. (xiii) Alica Garcia-Herrero, “The Emerging World: Debt as Key Risk,” Bruegel 2 June 2015, http://bruegel.org/2015/06/the-emerging-world-debt-as-key-risk/, accessed 22 November 2015. (xiv) Katy Watson, “Argentina Defaults for a Second Time,” BBC 31 July 2014, http://www.bbc.com/news/business-28578179, accessed 22 November 2015.